Rickets is a disease of children. Formation of bone is impaired so that the bones become soft. When the child starts to walk the bones of the legs bend, giving rise to “bow-legs”. In severe cases the pelvis will contract and if in a girl it will lead to subsequent difficulty with labour. It is due to deficiency of vitamin D, which is essential for the process of “ossification”, the incorporation of calcium into bone. Rickets was very common in industrial cities in the 19th century. A hundred years ago it was recognised as being due to lack of sunlight, which acts on the skin to produce vitamin D.
It was also discovered that vitamin D was present in fish oils, and this led to an opportunity to treat or prevent rickets despite lack of sunlight penetration through heavily polluted atmosphere. Cod liver oil became a standard medication for children in northern Europe, but this became out of fashion in the latter half of the 20th century when clean air legislation and holidays in the sun became effective. Rickets became a disease of history, but in the 1960s there were medical case reports of rickets in children of immigrants from South Asia into the northern parts of the UK. This became a more widespread problem as the result of increased immigration into the UK. In the USA rickets was identified in Black children. Dark pigmented skin is an evolutionary adaptation to tropical and sub-tropical regions where sunlight intensity at ground level would cause severe burn in non-pigmented white skin. The pigmented skin is less efficient in the synthesis of vitamin D but this is not important when sun intensity is high. It is of great importance when the individuals move to live in north-west Europe. The northern parts of the UK are further north than anywhere in China, and sun intensity is relatively low, even in the summer. South Asian people are adapted culturally to living in a hot hot sunny climate by dress that covers virtually all of the body. This is an important additional factor leading to vitamin D deficiency when resident in north-west Europe. The trickle of case reports has now reached a significant number, and among white children in addition. 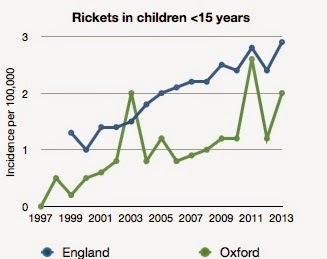 A study from Oxford has shown a significant increase in the incidence of rickets during the past 15 years. Incidence means the number of new cases each year. The numbers are small, one increasing to three per 100,000 children aged less than 15 years. The study includes both the incidence within Oxford and also within England. The incidence is lower in Oxford than in England overall, probably the result of a lower immigrant population. Ethnicity is important in the development of rickets, but it has been occuring in white children in recent years. Overall an important part of the increase in the incidence of rickets is an increase in the proportion of the ethnic minority and especially the South Asian of the UK population. During the past few years, the birth rate of the indigenous population has decreased by 2%, whereas that of the ethnic minorities has increased 19%. But the incidence of rickets has increased in white children, and this requires an explanation. There is no suggestion of a decrease in the intensity of the sun and so we must for behavioural factors. Not only white skinned Europeans carry Neanderthal genes. American Indians (from Canada to Chile/Argentina, Asians, Middle Easterns, Melanesians, Australian aborigenes, Africans north of the Sahara, all of them carry Neanderthal genes. The only people that do not carry Neanderthal genes are Africans south of the Sahara. Very interesting. I heard just today from a skin genetic anthropologist that the white skin inheritance from Neanderthals is just in the keratin layer of the skin and not the melanin component. It is all very interesting but I think the truth is that original homo sapiens was black and lightening of the skin with distance from the equator is the genetic/biological adaptation.